Eight pre-fabrication steel companies received the SFC and IIW MCS ISO 3834.2 certification at SCNZ September’s Steel Agenda event with the support of the Ministry of Business Innovation and Employment. The launch of the SFC scheme is an important milestone for our industry. As with other construction materials, the current compliance regime for structural steelwork relies, for the most part, on self-inspection and self-certification. This new scheme raises the bar by providing independent, expert certification of New Zealand fabrication companies. The scheme ensures participating fabricators not only manufacture product to the specified quality standard, but that they have appropriate personnel and quality management systems in place meeting national and international best practice standards. Front row from left - Jensen Steel Fabricators Luke Te Whau, Director Greg Jensen and Responsible Welding Coordinator Andrew Birks. 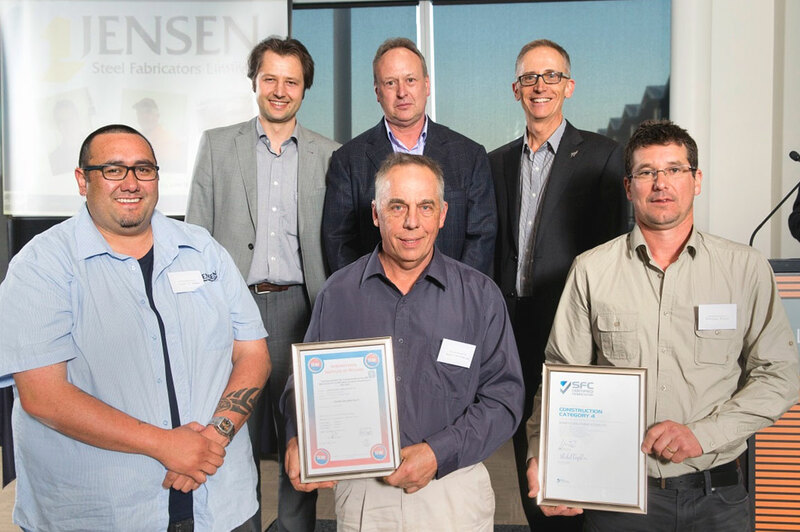 Back row from left - our Quality Assurance Manager Dr Michail Karpenko, General Manager Welding Centre Ben Christensen and MBIE CEO David Smol. 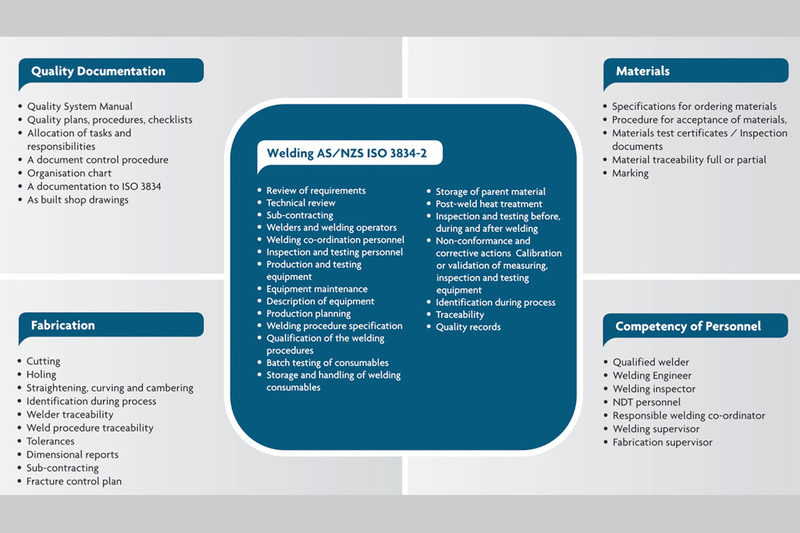 Weld quality is at the centre of the SFC scheme, and the International Institute of Welding’s Manufacturer Certification Scheme IIW MCS ISO 3834 is a key certification plank. It reflects the structural significance of welded connections, particularly those subject to inelastic demand during an earthquake. Importantly, weld quality is not readily verified after the fact so appropriate control must be applied to all aspects of the welding operation. Four construction categories – CC1-CC4 – are recognised in the SFC framework. It enables specifies to select a level of quality management appropriate to how safety critical the component will be in the construction. For example, the level of quality management required for a farm shed will be much less than that required for a large stadium. As well as the whole building, the CC-rating may apply to individual elements within the structure. For example, CC3- and CC4-certified companies must comply with ISO 3834 part 2 comprehensive; it’s this fundamental SFC prerequisite that brings the local structural steel product conformity requirements in line with international best practice. 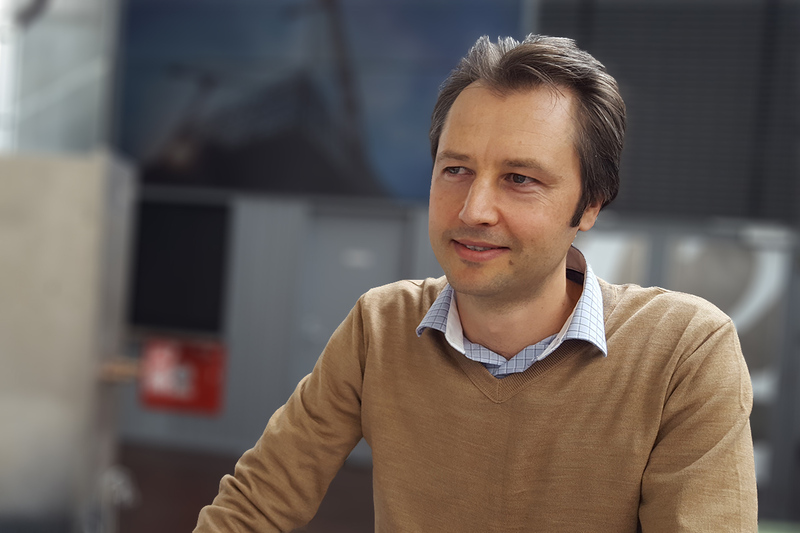 HERA will issue CC1- and CC2-certified companies with a single SFC certificate, while CC3 – and CC4-certified companies will also receive IIW MCS AS/NZS ISO 3834.2 certificates. Adopting this certification system is going to improve safety of the structural steelwork in New Zealand seismic environment and make it a bit more difficult for competing imported prefabricated steelwork that does not always have adequate quality records. The Scheme also streamlines the company’s operations and makes it more efficient. Long term, it would be a big saving for the certified companies.